Synopsis: When a teenager and her mother move to a little town, the girl finds that an accident happened in the house at the end of the street. But things get complicated when she befriends a boy who is the only survivor in the accident. Quick Review: Unfortunately, I don’t have much to say about House at the End of the Street since it is an average run-of-the-mill pshycho-killer story. Everything here is generic (victimized loner, cute heroine showing cleavage in tank top, clueless adults, jackasses school students, pointless friends of the heroine….) and the only redeeming factor is the presence of both Jennifer Lawrence and Elisabeth Shue. They provide strong performance amongst other weak cast members and despite a very poor script. I don’t want to spoil much here but needless to say you won’t be much surprised or shocked by the few twists in the movie and you will wish that House at the End of the Street actually had a shorter running time since the last 30mn is an overlong game of cat and mouse between Jennifer Lawrence and the killer, that seemed to have been designed for the sole purpose of placing the camera where Jennifer’s cleavage would be at her most advantageous. This movie was probably produced with young teens in mind as the perfect target market and is a really disappointing effort from Hush director Mark Tonderai. 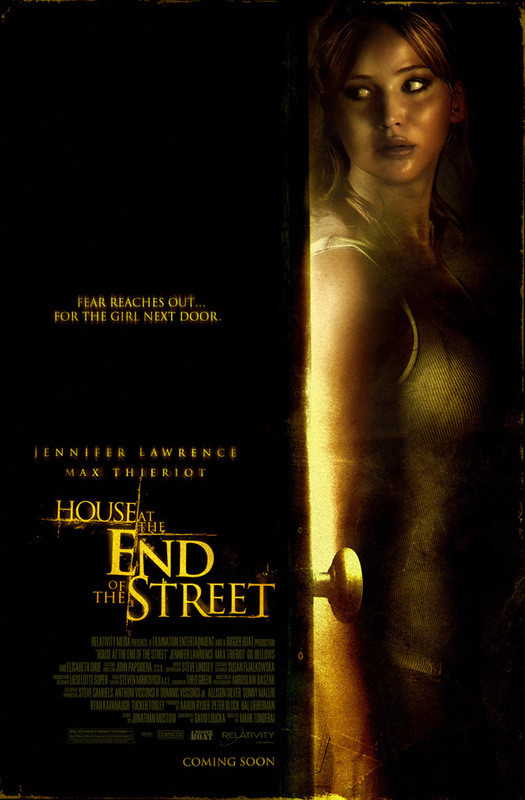 Click Here to Watch House at the End of the Street Now!